You might not know it from talking to me in person, but I can have some pretty strong emotions. However, over the years, I’ve learned to keep them bottled up. It might not be the healthiest thing to do, but it is what my life experiences taught me to do. Now NHL is showing some of the same strong emotions that I have felt and I’m struggling with teaching him how to manage them. Even nowadays, if I’m fighting with B over something and I feel myself getting angry, I get quiet. I’m deathly afraid that my anger will take over and I’ll shout something hurtful that I really don’t mean. I’d rather keep quiet, holding my anger in, than risk hurting B like that. No, it’s not healthy, but it’s the way I’ve learned to deal with the anger. Going back to NHL, he seems to show a lot of anger. Oftentimes, he’ll want to do something and we tell him "not right now." This triggers a screaming fit from him. Sending him to his room for doing something wrong leads to screams of "I don’t love you! ", "I hate you!" and "YOU GO TO YOUR ROOM!!!!" Clearly, NHL is having difficulty controlling his anger. I’ve talked with him about how being angry like that doesn’t help matters. That it is ok to feel angry, but letting it consume you like that does more harm than good. Another emotion that NHL and I have in abundance seems to be sadness. In my case, it mainly occurred in college. This was mostly due to my dating life. Or should I say my lack of a dating life. I won’t go into details, but suffice it to say that I went all through college without going on a single date. It’s not that I didn’t try to get a date. However, the girls that I asked out were invariably interested in me as a friend only. So while I saw couples all around me happily spending time together, I had no one. NHL exhibits some of this extreme sadness as well. When sent to his room, if he’s not screaming at us, he’ll start sobbing that he’s never going to get out and he’s never going to get to do anything fun ever again. I want to teach NHL to deal with his emotions in a more productive fashion than I’ve learned how to. So my Aloha Friday question for the week is: What do you do when you are extremely angry or sad? How do you teach your child to deal with anger/sadness? I tend to hold things in and stay pretty quiet. If it gets too bad, I always cry. My husband wants to have deep discussions about everything, which I hate (that’s bad of me, I know). When it comes to our kids, we try to tell them to talk about things and stay calm. Fortunately, we’ve never really had to deal with much anger or sadness with our kids. Our third child is 11 and he can be very moody. If he gets mad about something, he has been known to have a temper tantrum. But, they only last for just a bit, and if we see it coming, we make him go sit in his room until he is over it. 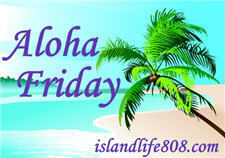 .-= Kari´s last blog ..Aloha Friday – Weekend Getaway =-. I’m one of those sappy silver lining kind of people. .-= Harriet´s last blog ..Dang it…I missed the list again….. =-. I don’t get mad often. I mean it takes a LOT to get to me, but when I do get mad I either scream and yell (this happens once every five years or so. Seriously) or I just clam up and try to be alone. .-= Janine´s last blog ..Aloha Friday =-. Well, I am a talker. When I am feeling overly emotional I talk about it. If I am angry I just keep talking to the person I am angry with until it is better. And sometimes I do say things to my husband that are hurtful and I am later sorry for. However, for my husband and I it is the only way to work past these things. If I am very sad I cry and talk about it. Sadness is harder because it cannot be talked away. It cannot be fixed. I am likely to not talk about something for days and then all of a sudden start talking about it again because I thought of it and I am still sad. I don’t know if that is or is not the healthy way to deal with things but it is what I do and it is what I encourage my kids to do. .-= Upstatemomof3´s last blog ..My Quiet Place =-. I cry sometimes but lately I hold everthing in! !Not good I know!